Fall in eastern North Carolina lends a sharpness to the shadows. Late afternoon sifts and stretches, and the world seems a bit more beautiful at the edges. Driving down the country road that has led me home for all of my 56 years, my eyes shift to shadows first, then sky. I watch, as a strand of inky birds dips and swirls down the roadside. They collide with others, their collected shape shifting like a sheet shaken in the breeze. It’s easy to remember, watching them, what just such a gathering did to my town almost 50 years ago. I wonder where they are headed, and what change they carry on their feathered backs. The tips of the maple leaves were just beginning to show fire that September when what we would come to know as The Birds first scattered all over my yard. Let your dog loose to run, and the grackles and starlings would lift up from the drying grass and take flight, drifting into long black ribbons until they found new places to land. We’d seen the grackles around, a few here and there pecking at our back yards for weeks, but as the shadows grew long and crisp in the early fall light, they would rise across the wide field then dip, swirling together again, almost touching the ground. As the weeks grew on and the sun began to sink closer to the trees each afternoon, it seemed as if hundreds more, thousands, moved from the corners of the sky toward a row of trees beyond the edge of the field, their wings waving in slow motion like monkeys from the Wizard of Oz. It almost put me in a trance, watching them dance, ribbons of black twining around an imaginary pole. There was some beauty to it, their shadowy dance against the pink sky. But as beautiful as it seemed at first, we couldn’t help but wonder if their arrival were some sort of omen, and what we were meant to see. My friend Lydia and I watched the birds spiraled into the nest of trees behind our houses at sunset — thousands of them — listened to them roar, swirling for hours until settling finally into the trees. The birds woke us each morning, scattering across the sky to who knows where, until dusk, when they came back, swirling again, black water down a drain of trees. What I didn’t know at the time was that something else was circling my town, and that our community — for a century divided along racial lines — would soon be cackling louder than the birds about it: the desegregation of the public schools. The birds, when I looked back on them now, seemed to me to be messengers of a sort, spokesmen for the black community, which had for far too long been kept mostly out of sight. Ours was an ordinary small town. Each morning, men gathered at the Idle Hour Restaurant for coffee, kids yelled in the school yard, tractors belched down Main Street. My father, the town doctor, listened to bare-chested patients as they breathed in and out. But as the white sun took on tinges of late-afternoon pink, we busied ourselves with taking cover. Mothers pulled clothes from the line, children at birthday parties dove beneath picnic tables, and perfectly reasonable people opened umbrellas in the clear autumn sky. That first fall, you could set your clock by The Birds’ comings and goings, and some, like me, abandoned clocks altogether. Who needed an alarm clock with 11 million birds traveling overhead at daybreak each day? And one look at the sky told me it was 4:30 p.m., as surely as my Snow White watch would have done. For then, the Birds flew back from their day of foraging — their airways from all corners of the compass, its center the giant funnel cloud that never left its footing. I suppose as a child I must have wondered where they went each day, but in truth, in daylight , they didn’t much matter to me. It was their coming home at night that captivated. How could so many converge in the sky in one spot when you never even noticed them scattered in the fields? I suppose it is with some irony that I would find myself thinking much the same thing on the first day of school in seventh grade. Our once mostly white classroom trailer would be filled to burgeoning with dozens of black children who, though they lived just across town, I had never seen before. Eleven million birds, that’s what the editor of The Commonwealth weekly newspaper estimated. 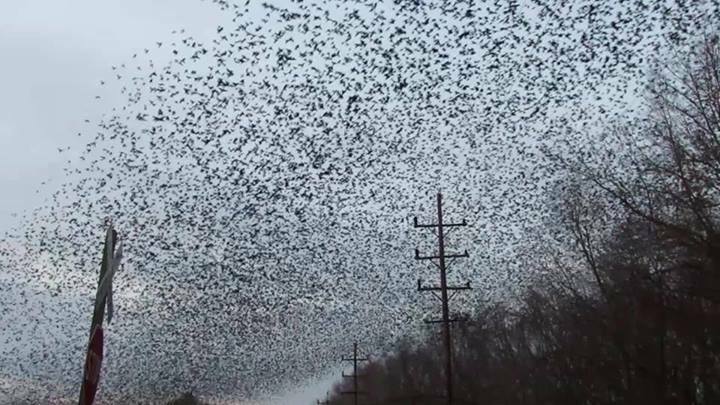 When he first tried to count them, using a complicated calculation of a certain number of birds per yard flying 30 miles per hour in a line a half-mile wide, 30 miles long, the figure was so astounding he knew no one would believe it, so he divided it in half. Even then, his estimate stunned the leaders of the town. And still their numbers grew, their cackles filling the dark winter air. All winter they stay, until one day in early spring, they flew out. This time, the late-afternoon sky remained quiet. That day, and for the whole spring and summer after. And the whole town sighed and got back to the business of being. The next fall on no particular day, the bird cyclone returned, and we were back to our skywatching. But townsfolk weren’t the only ones who took note. In late October, 1971, an NBC News crew came to town, and reporter Hughes Rudd beamed carefully chosen quips from the middle of the peanut field right next to the roost. In the background stood the lonely, withering winter trees, standing sentry as he pecked at our problem. He spoke if young people leaving in droves, called ours a “dying town” fit for no one, but a gathering of worthless birds. The mayor cried foul. We were very much alive, he said. The birds were but a temporary setback in an otherwise progressive existence. The Commonwealth editor printed pictures, not of the birds, but of our bustling Main Street, of the beautiful houses where my friends and I lived north of town, just a field away from the roost. The next week it seemed as if half of North Carolina had come to see The Birds for themselves. The boys in my class tied dead blackbirds to their bikes, popped popcorn and traveled the streets in search of hungry tourists. Letters-to-the-editor poured in, each with a solution to the problem. One writer even suggested that the birds were swarming to warn us of a nearby solid wall of deadly atomic radiation. And we should be grateful. We tried soaping them from crop dusters. We shot firecrackers, screamed at them over loud speakers, called in government experts, and still, they swarmed and roosted. The lure of the birds proved too much for Lydia and me. Though we had watched for months from the safety of our yards, we had to see for ourselves what it was like inside those woods. So one Saturday afternoon, well before the birds were set to arrive, we pulled on our coats and snow boots we rarely wore, and crept quietly to the edge of the woods. Then we stepped in. Within a few yards, we stood shin-deep in the powdery ash of dried bird droppings. Dead birds scattered through the woods, and though it was winter and the trees stood leafless, we could tell they were dead. Just dead. We covered our noses with the sleeves of our coats, the stench of rot and the must of the droppings so overpowering. Back at the fresh edge of the field, we vowed to return at sunset to listen. No one we knew of had been brave enough to stand in the middle of the roost at sunset. But as the day wore on, we chickened out, watching from Lydia’s back yard instead. They flew in right on time, swarming, circling. We watched as one-by-one each bird found a branch, a stump, a treetop to rest for the night, their wings stretching as they landed, settled. It seemed they would run out of branches before birds. As we headed home for supper, the birds still swirled, but by bedtime, all was quiet. From my first days in first grade in 1963, until my last days in high school in 1975, the country would be embroiled in a racial struggle that even today seems unable to dissipate. Though the nation felt the ripples of the March on Washington in 1963, the white community in my small town seemed to keep change at bay. Black children still attended their own schools, their parents still worked for farmers and as domestics, and they did all their shopping downtown on Saturdays — a day when few whites would venture there. 1968. The My Lai Massacre.Then less than a month later Martin Luther King is assassinated. Then the Tet Offensive. Then Robert Kennedy assassinated. We began to rely on the certainty of terrible news, just like we knew, come fall, the birds would be back. Though Brown vs. Board of Education had made segregated schools illegal years before, somehow my town had resisted, at least partially. A few hand-picked black children — Vironette, Clarence, Charmaigne and a couple more — had integrated my class a couple of years before. Others joined my sister and brother in theirs. The black community still had their own schools, which drew them together in what seemed to be the same way our white schools did. They were the center of the community, the pride, if you will, and though separate, as a child it seemed to me that their schools surely were equal to ours. Of course I’d never stepped inside a black school. Blacks and whites together — we lived in a poor county in what even then was a forgotten corner of the state. I was used to dog-eared textbooks, rumored to have been discarded by the city schools in Raleigh and sent our way. On the first day of school in seventh grade, we all showed up to our new junior high school, to new teachers and what seemed like a hundred black children I had never seen in my life. Vironette was there, as were Clarence and Charmaigne and the others, but they had been joined by friends, crowding us into trailers where teachers had little control. In my memory, two days later, most of the black kids except Vironette plus a smattering of new black faces disappeared. Nobody ever said what happened to them, and sadly, at the time I didn’t ask. I didn’t know then, that town leaders had created a town school system authorized by a special act of the state legislature rather than by the school board or city authorities. They re-drew the city limits, and though my house had stood just outside town a few days before, my siblings and I now lived inside the new line. The town limit sign would be moved in short order. If only it were love. That would be something. But hate drew this line, and fear. The circle they drew left out almost the entire black community. Most of the black kids who shared my classroom in the first days of school in the fall of 1969 lived outside the circle. Some white families had already left the public schools in the mid-60s, but my parents were among those who tried to remain. My brother would graduate from high school in 1971, and my father — who had many patients from the black community — felt by then things would settle. Really? That my own parents’ generation believed this is baffling. How is that that you can have black employees who cook your food and wash your laundry, care for your children and tend your crops, but you cannot allow the children of those who serve you to share a classroom with your own? The question swirled in my head then, as now, like 11 million blackbirds searching for someplace to settle on the answer. By the fall of 1970, white flight happened anyway, and I found myself in an all-white private school that didn’t allow any black students. Vironette, who had been our classmate for almost five years, once ask me why she couldn’t go, too. I never knew what happened to her, though I have always wondered. The Birds flew out one early spring day in 1972 as I remember it, and never came back. They had used up their squatted property, and moved on. But what they left in their wake was a town damaged, and we would never recover. In June that year, the Supreme court handed down its decision: form one cohesive school system, merged with the county. The county consolidated the high schools and moved the new school out in the county. Though the purpose was for the good, both the white and black communities had lost our centers. The white high school that had nurtured hundreds of Fighting Scots, through chemistry class, and classic novels, through May Pole dances and Friday night homecoming games, was gone. So, too, was the black high school. In the years since, the county system — 87 percent black — has struggled with poor school performance. In 2013, half of the state’s 13 poor performing schools in my home county, despite being in the midst of a state-ordered intervention. Driving through my hometown today I see only the desperation. The old dime store where I bought my Blue Horse notebooks each August is boarded up. As is the department store and a dozen other places that both white and black patrons used to frequent. The movie theatre has been gone for years. The old high school auditorium where I danced tap and where my brother was awarded his Eagle Scout, is there and is used for community event, my first grade classroom converted to town offices. The old high school is gone, the only remnant some brick pillars that marked the way to the Senior Steps. There are few white faces anywhere downtown, just clusters of young blacks in droopy clothing loitering in the grocery store parking lot. Rumors fly about the east side of town being a haven for drug dealers and users. After my father’s death last year and after two attempted break-ins at our family home, we moved my mother to safer environs for an 86-year-old living alone, leaving the town I have loved for so long in the rear-view mirror. The white community keeps to itself mostly, though some are trying to bring back a sense of community to this place that will always, it seems, be divided. There is a new hardware store in town and a new restaurant, the old gymnasium where my brother was crowned “super soph” for his basketball prowess, has been turned into a senior center. And just east of town, a solar farm rises up on land that used to sprout cotton and tobacco. It is among the town’s few new employers, and building it is providing employment, although temporary, for 300. When complete, it will be the largest solar farm in the state, a bright spot in reality and in theory, for this forgotten corner. But I still can’t keep from thinking of the what ifs. What if the white parents, so filled with fear they were of their children attending school with black kids that they were willing to fight an amendment right — what if they had stayed, poured their resources into the schools and moved forward instead of away — would my town have survived? The birds swirl, and I am left wondering. Susan Byrum Rountree is the author of Nags Headers, a regional history set on the Outer Banks of North Carolina, and In Mother Words, an essay collection. She blogs at writemuch.blogspot.com from her home in Raleigh. This is her second publication by Essays on Childhood. Her first essay, Pick a Little Talk a Little, appeared May 1, 2012. Parts of this essay have been excerpted from The Blue and Gold Mistake, Susan’s novel-in-progress.